A cruise ship is like a floating city with its luxury restaurants, cozy hotels and penetrating joyful atmosphere of fun. Skilled and experienced engineers, cashiers, secretaries, hairdressers, musicians, electricians, croupiers, cleaners, nurses, cabin stewards, bartenders, cooks, photographers, waiters, carpenters, shop assistants and many other specialists are persistently needed on board. Working on the ship is an excellent opportunity to work, travel, and save money at the same time. 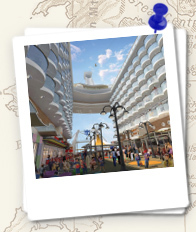 Giant cruise companies are constantly growing and expanding their operation on the international arena. Every year new cruise ships enter vacation service. The companies naturally need more and more employees willing to add even more excellence to traditionally perfect customer service. Most of the cruise companies employ international crewmembers from Italy, Norway, Philippines, Jamaica, Poland, Russia, Indonesia, Peru, Austria, Turkey and other countries. People of different nationalities work and live together sharing common interests and often becoming friends.